I have a fear of heights, but I like to challenge that fear and myself whenever I can. 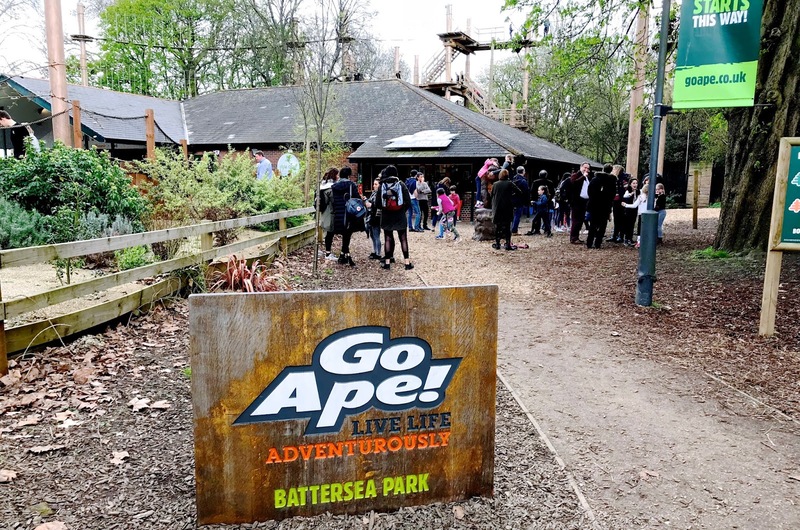 So, with that in mind, when my husband refused to be helpful in choosing a gift for his birthday, I went for the experiences option and treated him to an afternoon at Go Ape Battersea, an adventure park where you can clip on and climb your way around a treetop adventure course. After climbing the O2 Arena a while ago, I thought I'd be able to handle something like this. I felt I was up for the task. Booking Go Ape online is simple and easy. I was impressed that they confirmed our date & time a day before our visit with an informational email about what our visit would be like, what to bring, what to wear, etc. We had everything we needed for a great day out. 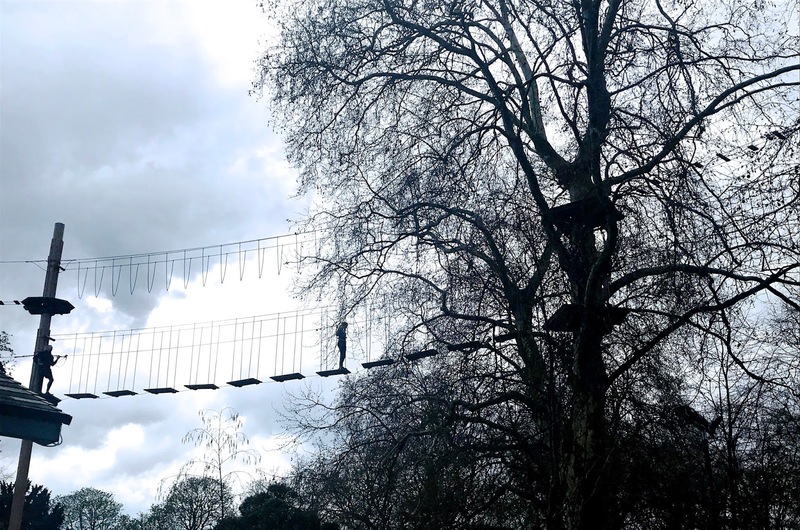 Go Ape Battersea is easily accessible by public transport. We took a train to Clapham Junction, walked a few feet and grabbed a bus that dropped us off only steps from the park. Once inside the park, there are signs so it's pretty easy to find where you're going. 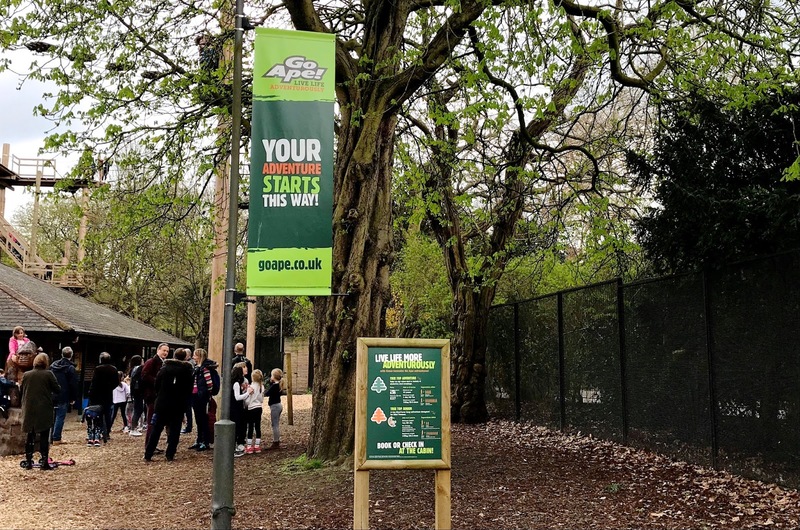 Go Ape is located in a spot along with a mini golf course, a playground and a bar/cafe area, so you really could make a day out of it if you wanted to. It's also worth noting that there are lots of other fun things to do and see in beautiful Battersea Park, so planning to spend more time there would only add to the enjoyment of your day. Upon arrival we headed to the Cabin where we checked in, filled out forms and received our wristbands. You're not allowed to bring anything with you on the course except glasses or sunglasses and if you do, you'll be required to wear a retainer so they don't fall off. There are lockers available to lock up anything you want to store like your phone, wallet, etc. and once you've gotten that all squared away, an instructor will help you with your harness. The harnesses are very tight and I mean tight! You want to wear something that covers your midriff and you'll probably want to wear long trousers of some kind as well. Workout wear will undoubtedly be the most comfortable. Be prepared to have parts of the harness digging in to your waist and ahem other areas... It's normal. It has to be tight - you get used to it after about 5 minutes and by the time you've moved on to the training course, you won't notice it at all. After you've got your harness on and you've been briefed on some safety rules, the instructor will take you to the training course. It's a small simulation of the main course and you'll go through it to ensure you understand how the safety system works. After a whiz around that and a quick verbal pop quiz to make sure you understand the rules, you're off for what's sure to be an unforgettable adventure. The course starts at a staircase where your harness is checked one more time and you're linked onto the safety system. This is where you'll decide who in your group is going to go first and you walk up the stairs together to a platform. Straight away you're faced with your first pass, which is deemed to be the easiest. This is where the whole experience started to get dodgy for me. Remember how I said I'm afraid of heights? Somehow I ended up being the first one in our group and I just couldn't do it. The step from the platform to the swinging wooden step looked like too much of a leap for me. In reality, it wasn't, but I froze, started to panic and that was it... I couldn't deal with the pressure of having people waiting behind me. I couldn't lead them to the other side. I couldn't even move and then I was pretty embarrassed to find that the only way out is to force all 6 people in my group to go back down the stairs, detach from the safety system and then reattach. I was mortified, but it had to be done. Who was the genius that decided someone who's afraid of heights would go first? Oh yeah... Maybe that was me. Oops! I had somehow been under the false impression that I wouldn't be alone on the passes. I thought there would be a hand I could hold if I needed to or a calming voice beside me. I had somehow assumed that my husband and I would be climbing together. While we were in the same group, this is just not the case as there can only ever be one person on a pass at at time. After annoying everyone in my group by making them come down just as fast as we all went up, I took a moment with my husband to compose myself and we then decided that maybe I could do it if he went ahead of me. So we reattached to the safety system, headed back up the stairs and then guess what happened? One of the kids in our group couldn't face it either... So back down we went. The brave kiddo then decided he could probably do it if his mother went first, so back up we all went again and she hesitantly headed across the pass with relative ease to join the rest of her family who seemingly had no fear. The little boy followed and though terrified, succeeded in getting across. If he can do it, I can do it I thought. Then my husband followed and walked across like it was nothing before it was my turn. I was determined. I was feeling brave. I knew I could do it. I manoeuvred into position and then my pulley got stuck, but I managed to sort it out and I was there, ready to take the first step onto the first board. I put my foot out, felt my standing leg tremble and I froze. I stopped, put my foot back on the platform, took a deep breath and told myself I could do it. I tried again, but then I could feel the tears starting to come as the inability to breath settled in and that was it. I told my husband to go on without me and have fun before I was making my way back down the stairs, feeling exhausted from the adrenaline, scared to death and completely disappointed. Fear can be such a bummer sometimes. Normally I'd have had a good hard cry about a situation like this one. I hate not being able to do something I want to do, especially when everyone else seems to be able to do it so easily. It looked fun and I felt left out. I also felt like I'd disappointed my husband because this was his birthday treat and we were supposed to enjoy it together. For some reason I didn't cry at all after leaving the platform. I simply had my harness removed and went to request a refund as I'd been instructed. I was happy to find that my full ticket price was kindly refunded, so at least I didn't have to feel disappointed at wasting my money too and I went to grab a coffee at the cafe with hopes that I'd be able to watch my husband swinging through the trees. He only made it through the first course by the way. The man has no fear of heights, will often stand on the edge of a cliff and yet claimed he was slightly terrified by the treetop adventure. With one look at the second course, he decided he was done too. I must admit that made me feel a bit better. Apparently the little boy in our group only made it through the first 2 passes and freaked out on the third one, bless him, before having to turn the whole group around to go back and start again so he could come off of the safety system. I imagine he might have felt a bit disappointed too, but hey - he lasted a lot longer than I did. Fair play to him! Not long after sitting down I had a realisation. I didn't succeed at trying the course, but the reason I didn't cry was because I feeling disappointed at missing out, but not in myself because I at least gave it a try. A few years ago I would've never considered trying a Go Ape adventure. I certainly wouldn't have made it past the safety briefing where they talk about things that could go wrong if you don't obey the rules. I wasn't able to step onto the first pass, but I was close. The important thing is that I tried - after all, it's all that any of us can do. In the moment, I simply could not put one foot in front of the other. It's a feeling I've had so many times whether climbing a tower in Bologna or at the top of the Eiffel Tower in Paris. Once the moment had passed I started thinking... It's a trust issue. The thing I never considered while I was up there was that the harness would hold my weight - it's what it's there for. I was safe and yet all I could think about was danger. I wasn't putting my trust into the equipment and in order to move, I would have had to do that. After thinking about it, I feel like I will try it again. I know I'll try it again, because as I said before, I hate not being able to do something because of fear... It just leaves a regretful taste in my mouth and there's no end to the FOMO. So I'm ticking this one off my list as a stepping stone and thinking about when I'm going to try again. And that's absolutely okay. "The one who falls and gets up is stronger than the one who never tried. Do not fear failure but rather fear not trying." I'm writing about this for two reasons. Firstly, I didn't complete the course, but my husband did and we both had different, yet very pleasant experiences (for the most part) and I think that's worth a mention. Go Ape is great! The staff are lighthearted and friendly, the courses are clean and it's not overcrowded. I'd definitely recommend a visit and for those of you who are brave enough to get around the course, you'll receive a certificate and a sticker at the end. It may not seem like a big deal, but some day I look forward to getting that sticker! I also wanted to write about this experience because there's no shame in trying something and not being able to go through with it. I booked my spot at Go Ape, paid for it, went through the training and safety briefings, but I didn't make it onto the course. That's okay. As for the little boy who only made it to the third pass before turning around - that's okay too. He did his best! It's still an experience and one I'm very glad I had. If I had felt just 1% different in that moment, I might have taken that first step, but if I had been to afraid to book in the first place, all I would have is that horrible feeling of never knowing. I want to encourage you to try, even if you're scared, because you might very well surprise yourself. You might also chicken out in the first five minutes, but that's cool too. The point is, if you don't show up, you'll never know. If you get through it, fine. If not, you can go downstairs, get something from the cafe and play a round of mini-golf in a beautiful park... It's not the worst way to spend an afternoon. 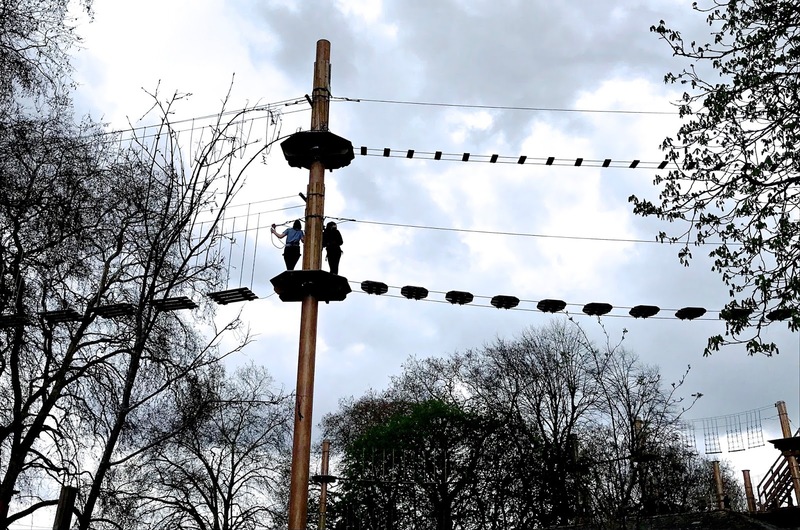 A Treetop Adventure at Go Ape Battersea starts at £36 for adults and £28 for kids. There are requirements for height, ages and supervision, so it's best to check those out before you book if you're bringing the kiddos just in case. There's also a juniors option available for younger kids. 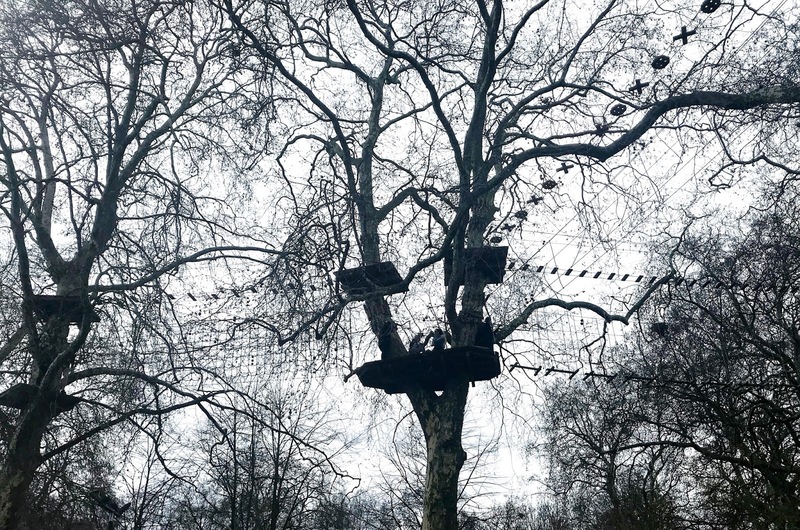 For more information on Go Ape Battersea, other locations and to book your adventure, visit goape.co.uk.